Is the Windows Surface tablet able to compete with Apple? We are less than a fortnight away from the launch of the new Surface tablet from Microsoft; its first ever offering in the tablet market. It’s long overdue, and the tech world is getting excited… including us! Microsoft has a long and positive history of creating well-built powerful desktops and laptops, but how will it fair in the tablet market, which has enjoyed an impressive boom over the past couple of years? Do Apple and Samsung have anything to be afraid of? And what will be under the hood of the new Surface tablet? Our first impressions of the surface tablet are good. It’s stunning looks and bold colour options make a real statement. But what else will you get in return for a reported £300? The inbuilt keyboard, which also acts as a screen protector, is a great feature of the Surface tablet, combining the portability and usability of a tablet, with the functionality of a laptop or netbook. The inbuilt stand, further allows the Surface tablet to be the ultimate office companion. It will be available in two specifications, one running a full version of Windows 8, and the other (intended more for personal use) a version of Widows RT. Both are powerful operating systems, capable of handling a wide range of tasks. So, let’s get down to the important features. The Surface tablet boasts a 10.6 inch screen, a fair bit bigger than the 9.7 inch display offered by Apple’s iPad. Microsoft claims the Surface tablet will have a full HD multi-touch display too, which is always good news. So that’s 1-0 to Microsoft. However, where Apple gains a point is in the size department, where the Surface tablet loses with its weight. It is slightly heavier than the new iPad, which could prove problematic with regular users of the device. But where the Surface tablet really pulls it out of the bag is its impressive memory options. Customers can opt for a massive 128 GB of memory – blowing Apple’s maximum 64GB out of the water. Along with the impressive internal memory options, the Surface tablet is also capable of accepting MicroSDXC cards, to further increase the memory. The Surface tablet also boasts a mini USB connector (2.0 or 3.0 depending on the spec) and a mini HDMI connector. So what about its other contenders? We know Apple has the brand name, and a huge following, but Microsoft has the heritage and the solid operating system. With the highly anticipated launch of the iPad mini, the question to really ask is whether the Surface tablet will be overlooked in favour of the new release from the tablet giant that is Apple. Or will people take a leap of faith, and lean towards Microsoft? 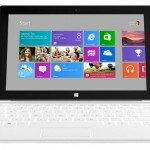 Does the Microsoft Surface tablet excite you? Or would you prefer to stick to trusty old Apple?